Posh manager Grant McCann applauds the 111 travelling fans who made it to Barnet in the Checkatrade Trophy. Peterborough United chairman Darragh MacAnthony has defended his club’s vote for a slightly-amended Checkatrade Trophy to continue with Premier League Under 21 sides included next season. 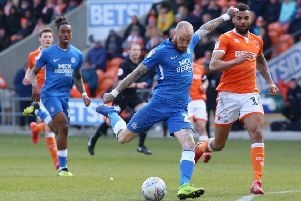 Increased prize money appears to have been the biggest factor in Posh backing the revised format which also includes changes in team selection rules. The prize for winning a group match has doubled to £20,000 as part of an extra million pounds being pumped into the competition, mostly by the Premier League. “Common sense has prevailed,” MacAnthony said. “It’s a competition we needed to keep, but there also needed to be a few changes to the format. We voted for the revised format. “I know some fans will accuse us of a sell-out and I empathise with those who were ‘wound up’ by the competition last season, but we are a football club that loses a lot of money every year and this is a good chance to get some of it back. That’s the reality of the situation. “Things that irritated last season have been adjusted. We have reached a happy medium. Just ask Oxford, who have reached the final for the last two seasons, of the benefits. They must have made a million pounds and it has doubtless helped them to win a promotion. League One and Two clubs voted on three options, keeping the Premier League clubs, reverting to the old 48-team format or ending the competition. Two-thirds of clubs lent their support to the 64-team format with Premier League clubs taking part. The clubs will again be split into groups of four, but Premier League clubs will now play all their games away from home. Two will qualify for the knockout stages. Third-tier and fourth-tier clubs are now able to choose any goalkeeper and only four starting outfield players now have to be ‘qualifying first-team players’, while invited sides need to have six under-21 players in their starting line-up. ‘Qualifying first-team players’ have to possess first-team Football League experience. The prize money for the competition has increased from just under £2m to £3m - the bulk of which comes from the Premier League - and regionalisation of the competition will remain until the quarter-final stages. There has been no guarantee from the Premier League clubs who refused to participate this season - including Arsenal, Tottenham, Manchester United, Manchester City and Liverpool - that they will be involved next season. Football League chief executive Shaun Harvey said: “We wanted to ensure that League One and League Two clubs had the opportunity to make the key decisions regarding where we take the competition in 2017-18 and beyond, and I believe we have reached a revised format that benefits all parties. Last season’s competition was blighted by fan boycotts and low crowds, although the final between Coventry City and Oxford attracted a record attendance in excess of 75,000 to Wembley. Posh were eliminated after losing home group games against Norwich and MK Dons in front of crowds of 1,696 and 1,793 respectively. A ‘dead’ rubber at Barnet followed which was watched by just 393 fans, including 111 Posh supporters. Ironically Posh were fined after winning at Barnet for breaking team selection rules.